Finally a bag big enough to fit everything you need and more. Go big or go home! 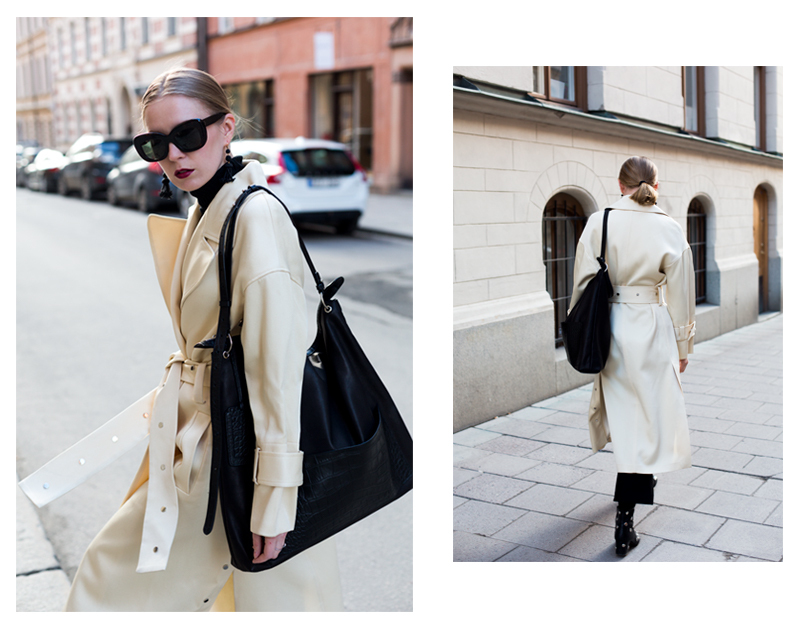 TRENCHCOAT By Malene Birger. EARRINGS Céline. TURTLE NECK Vince. SUNGLASSES Céline. BAG Little Liffner. PANTS Weekday. BOOTS Bimba & Lola. This entry was posted in Outfit and tagged little liffner by Carolina Engman. Bookmark the permalink. Always looking astonishing! Fabulous bag! I always prefer cross body bags more than big tote bags bc they’re easier to move around with haha. But I do love the way a nice slouchy leather tote looks! This bag is so perfect, I love it! Love the size and the shape. Love this big bag! So useful. Love big bag too. This sunglasses are just awesome. oh don’t need a bag after this one! I aint a big expert, but I love the way this bag is teamed with an oversized cream-white belted coat. In love with oversized black sunglasses! This is right on trend- love it!!! Amazing outfit. The trenchcoat looks so chic. The most I loved is the long earrings. The colour and the length of the tassel is perfect. Love how classic this bag is! Perfect for all my essentials! "when in doubt, wink, peace and pout!"